So Lonely in Gorgeous: I Am Number Four...Not Really But I Got A Fourth Award!!!! I Am Number Four...Not Really But I Got A Fourth Award!!!! List 7 things about you. You'll never see me sporting a Louis Vuitton handbag. Many moons ago, two of my clients gave me a Louis Vuitton handbag as a gift and I ended up giving it to my sister. I was grateful and appreciative, but I'm just not into those kind of bag...I'm just not my thing. As I'm writing this my stomach is growling...HUNGRY! I have a very scary memory. I know the names of cosmetic product (i.e. blush, eye shadow, lipstick, etc) just by looking at the color. I can tell you what you and I were wearing, what we talked about,and details of that day from years ago. I never forget a face. These are just examples. I'm deathly allergic to kiwi. Congrats again ladies, love all your blogs! I can't believe it! 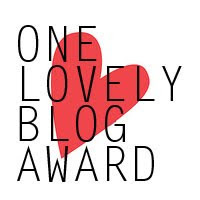 I was just wandering in your blog when I saw I was nominated for an award. Thank you and congrats! SURPRISE!!!!!!! :P enjoy it sweets, your blog is awesome!